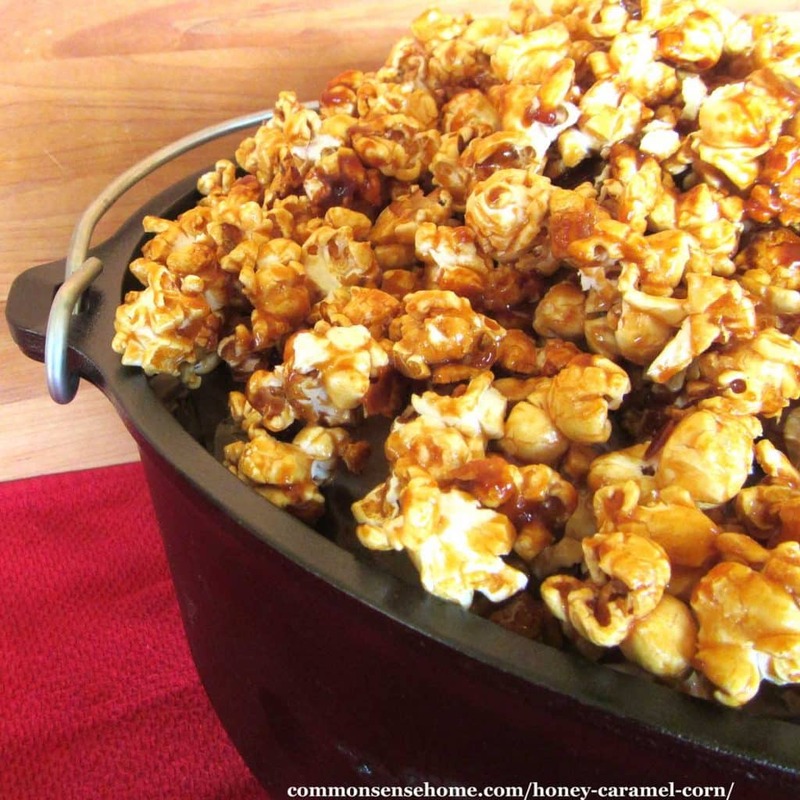 Our old fashioned Honey Caramel Corn Recipe is light, buttery and delicious! This snack is great for gatherings or an anytime treat. When I was a little girl, one of the treats my Grandma Catherine would buy me was CrackerJacks™ caramel corn. I had a collection of all the little toys they put inside the boxes, from mini-holographic photos to magnifying spyglasses. I enjoyed that sweet, crispy buttery caramel corn, but haven't purchased it in years because they use ingredients that we try to avoid, like genetically modified soy and corn. My friend, Shannon, mentioned that her family always made a delicious honey caramel corn recipe for the holiday season. She messaged me a copy of a handwritten list of ingredients, saying that she remembered they used a thermometer but didn't remember cooking details. A little online digging revealed a recipe that sounded similar, so I married the two together and came up with a recipe that reminds me of grandma and the way things used to taste. 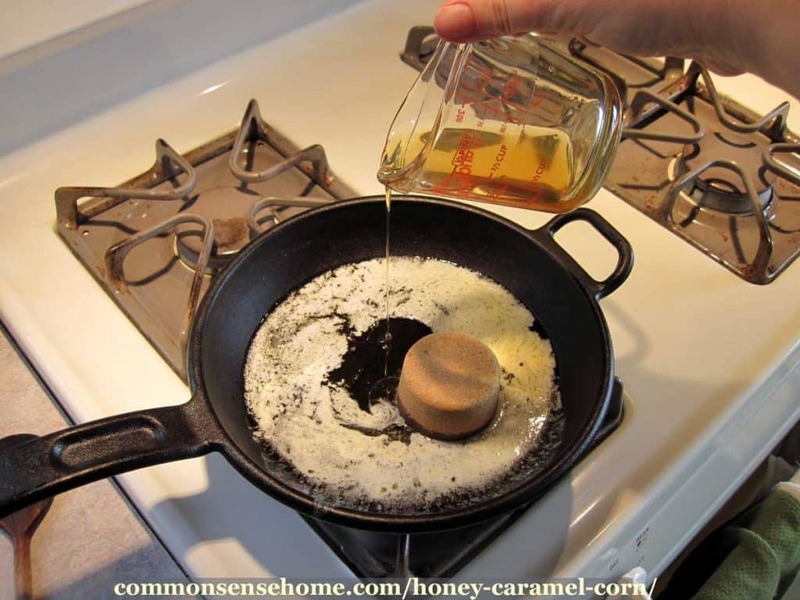 Melt butter in large saucepan or cast iron skillet; stir in sugar, honey and salt. Cook and stir until mixture comes to a boil. Reduce heat to medium; boil without stirring about three minutes to 265°F (130°C – hard ball stage). Remove from heat; stir in vanilla extract and soda. When you add the soda, the color will get lighter and the mixture will get more bubbly. Place popcorn in large oven-safe bowl; slowly pour syrup over popcorn while stirring. Turn onto greased or reusable parchment paper covered baking sheet. Bake at 250°F (120°C) for 45 minutes; stir every 15 minutes. Cool. Break into serving-sized pieces. Store in airtight container. Makes four quarts (eight servings of two cups each). You can make a bigger batch of honey caramel popcorn and pile it up in a Dutch oven for an attractive, rustic centerpiece on the serving table. Old fashioned honey caramel corn is light and crispy, buttery and not too sweet. Reduce heat to medium; boil without stirring about three minutes to 265°F (130°C – hard ball stage). Remove from heat; stir in vanilla extract and soda. Turn onto greased or reusable parchment paper covered 15-1/4×10-1/4×1/4-inch baking pan. Bake at 250°F (120°C) for 45 minutes; stir every 15 minutes. Cool. Break into serving-sized pieces. Store in airtight container. Makes four quarts (eight servings of two cups each). P.S. – I'd love to hear your stories about family favorite recipes or recipes you remember from childhood. Leave a comment below and share your thoughts. Originally posted in 2014, updated in 2018.
thanks for the great bread recipes. when i was too smart by 1/2 at college, i had roommates that made bread with beer, but I was too dumb to pay attention. Any thoughts? Was it a yeast bread or a quick bread? The top search result is at Food.com, and it’s a quick bread beer bread. 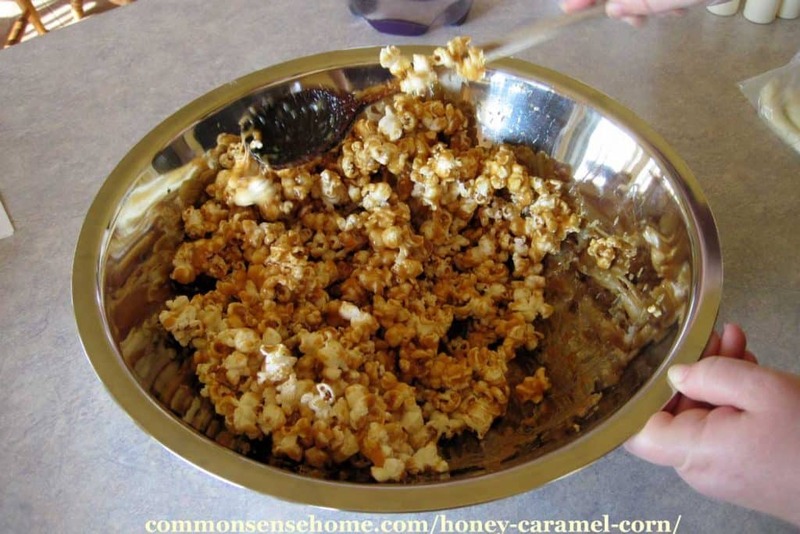 We are huge fans of Caramel popcorn, this is a wonderful little twist to the recipe we will be trying!! Thank you for having a “free” entry for the honey giveaway, as I am not a subscriber to Facebook. I really appreciate the opportunity! Thank you again!! Danielle – there should be a free entry on the cast iron, too. It’s been a crazy week and I missed that it wasn’t there. Checking with Melissa to get it added, and it should be up later today. Thanks for letting me enter your contest. My favorite recipe is ckili slow cooked in cast iron. This looks like an amazingly yummy recipe! Thanks for posting it! My favorite recipe, especially this time of year, is plain old chili! I love cooking with cast iron. Looks like a good recipe, also excellent made with local molassas that gives magnesium and other trace minerals. I can’t wait to try the popcorn recipe! I think that would make fantastic Christmas presents for friends! This Honey Caramel corn looks yummy. Just getting back into beekeeping after a bear destroyed 11 colonies last year!!!! Oh no! I hope you can rebuild your hives. I love cooking apples in my cast iron! My favorite cast iron recipe might be cornbread! My favorite recipe is for yeast rolls. My mom taught me how to make them as she made them for family gatherings. Though it took me years to “perfect” the making of them, I always enjoy (along with many others) the fruits of my labor. Thanks for the yummy caramel corn recipe. My family loved it!! My new favorite recipe is for Mexican style rice, it so simple and doesn’t come from a package. But I really want to start working on making homemade breads. I don’t really have a favorite recipe. I like to cook vegetables a lot but I don’t use a recipe when I cook them, I just use whatever I have on hand. My favorite recipe is for Buttermilk Biscuits! I love making my peach cobbler in my LODGE dutch oven over an open fire. love caramel popcorn, thanks for sharing the recipe! Thanks for the caramel corn recipe. My favorite recipe in my cast iron skillet is fried potatoes. Thank you for the recipe for the caramel corn! It looks wonderful! ZachI love the cornbread reciepe! I lo e good cornbread. I can’t wait to try the carmel corn…it sounds like the “crunchy” kind I like so much (not the soft one that isn’t as yummy!). I, too am glad for the ‘free’ entry as I am not a Facebook person (maybe someday). Thanks for all the great info you send out! Just make sure you keep it airtight after baking, or eat soon after prep, as it will soften if left out. No more facebook entries after November 3rd, although I will still have pinterest follows as entries. It’s just a tool for me as a blogger to reach out to people. I do always try to include a free entry, because I realize not everyone is on social media. This sound like my kind of recipe . Love that the recipe does not have corn syrup and also that one can use coconut oil rather than butter ! I will definitely be trying this recipe for the holidays. Thank you for sharing ! My favorite recipe is Milwaulke slow cooked roast. Delicious and melts in your mouth. What a wonderful giveaway, thank you for the opportunity! I loved CrackerJack as a kid. Excited to try this recipe and start a new tradition for the holidays! A beef curry we make for company all the time. Thanks! We love caramel corn and we love honey. This recipe looks amazing! Thanks. Can’t pick a favorite recipe as they all become fav’s as I use them—today a soup – tomorrow a cake—who knows what next?? Thanks once again for a fabulous recipe, and a chance to win great prizes….appreciate your dedication! Going to try this honey carmel corn today. Thanks for posting. My favorite recipe happens to be any one associated with a holiday. I love cooking for my family when they gather at my home for a holiday! Thanks for doing the giveaway! The honey caramel corn recipe looks delicious. With Halloween coming up I started thinking about popcorn balls…. this caramel corn recipe sounds perfect for this season…. My favorite recipe is “Hungarian Gulash” and I wish these sites would STOP using facebook, I am not on facebook, can’t post there and want nothing to do with them…they are phishers! My two favorite oven baked cast iron recipes are for sweet corn bread and my mom’s amazing tamale pie. Can’t wait to try the Honey Caramel Corn recipe! Thanks for the Cast Iron Giveaway. I can see it now, Honey Caramel Popcorn balls in the Christmas stockings. Caramel Corn is super delicious, my favorite recipe. My grandma made THE BEST raisin pie. I haven’t received the “secret” ingredients yet. My mom says she’ll pass it along when she is called to Heaven. In the mean time, heaven here on earth with raisin pie and my Mama! Thanks so much. I live your magazine! Every year for Halloween my mother would make popcorn balls to give out to trick-o-treaters. We would make the popcorn into balls and wrap them with clear plastic wrap and tie the ends with curling ribbon. You can’t hand them out to the public but they are great for a party! My mother used a recipe with corn syrup from I think the Fanny Farmer Cookbook. I really enjoy there tips and hints! Yeah just saw caramel corn at costco didn’t buy, said I was going to make some! Nothing I like more than regular buttered popcorn is Caramel Popcorn. I hope I win. I love Cast Iron. I am eager to try your honey caramel corn. It looks delicious! During this time of year my favorite recipe that my wife makes is her Pumpkin Crisp desert casserole. It’s the best ever! Have tried (successfully) many of your recipes. 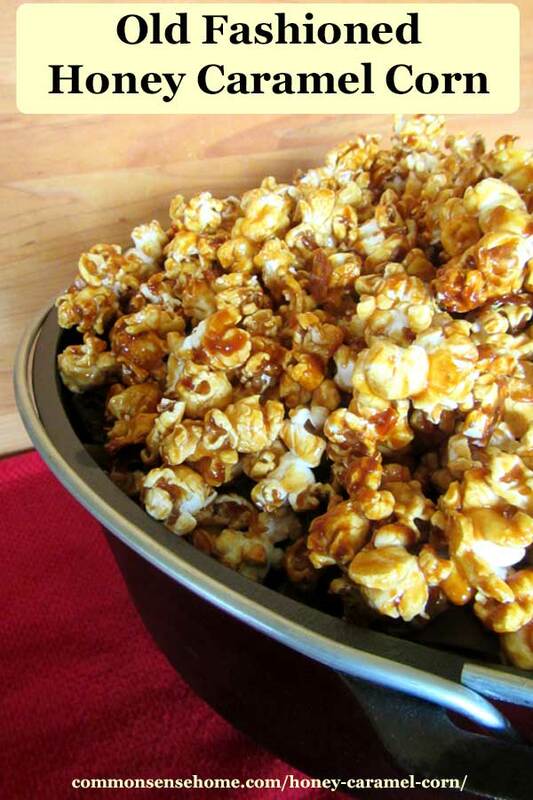 Thanks for sharing the Honey Caramel popcorn recipe. Will make some for my family when we’re housebound due to cold wintry weather (like today). Again, thanks for sharing and for the giveaways! I remember the Cracker Jack and like you, haven’t had it in years simply because it doesn’t taste anywhere like it used to. And, because I’m really trying to eat better, I –who don’t like to cook anyway– am trying to juice more often than not and so far I haven’t really made a juice I didn’t like. But, my favorites are proving to be those that include beets, cucumber and celery. My mom used to make the BEST caramel popcorn balls to hand out at Halloween… It was a big deal and meant bringing out the biggest ceramic salad bowl for tossing the syrup with the popcorn. Her recipe is long gone as is she, but I still like caramel popcorn, and I’ll be trying this recipe for sure! Thanks! Now I’m hungry! That caramel corn looks yummy! Thanks for sharing the recipe! Caramel popcorn. Thanks for the giveaway! I also belong to all the blogs listed, just don’t “Facebook” about them, but do share links to them with others. There still is no non-Facebook entry for the Cast Iron giveaway. I really love all the recipes posted here. It has been quite awhile since I had even plain popcorn. I did have a caramel popcorn recipe once, but have misplaced it, so this is great! On the cast iron giveaway, very bottom of the list, “Leave a blog post comment sharing your favorite recipe”. For some reason, popcorn seems like more of a fall/winter treat in my head, maybe because of snuggling up by the fire or under a blanket for movie night. Thank you for the recipe! I like that you make it with honey. I think I’ll try it with maple syrup too. My favorite recipe is homemade chicken soup with homemade chicken stock and lots of veggies. I love reading all of the tips and recipes on you site. I can’t wait to try this! My mom made caramel corn as a treat occasionally throughout the winter months when I was growing up. This brings back a lot of happy memories. Holy moly, I can’t wait to make this popcorn with my kids! And I own just own cast iron grill pan. I could really use this set! Great giveaway. I love cornbread cooked in a cast iron skillet. This is a great giveaway! This time of year chili with cornbread is my go to recipe. My favorite recipe is my baked potato soup recipe with fresh honey wheat bread mmmm mmmm! 265F is the correct temp. My boy loves popcorn and I prefer to make my own rather than buying it from the shop. This is the perfect recipe. Something simple but hmmm… so tasty. 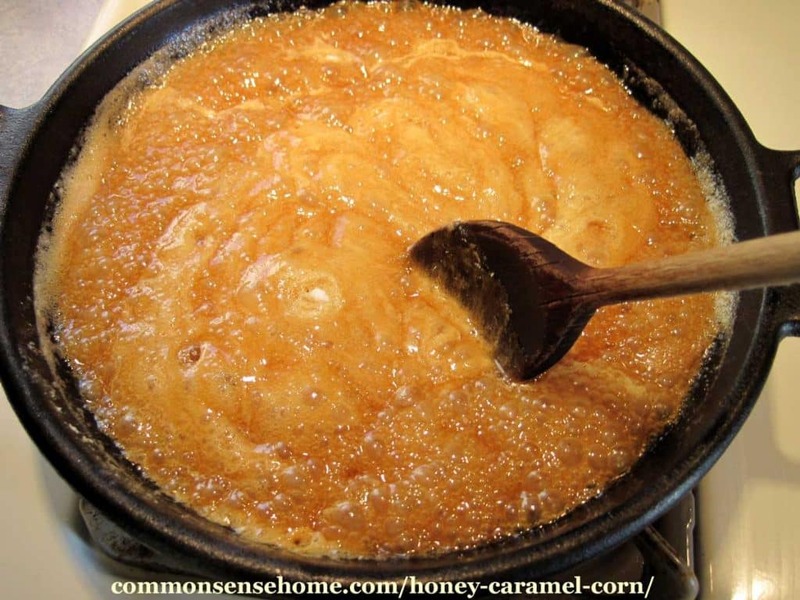 Just wondering, other than honey caramel, do you intend to offer other caramel recipe? There’s currently a caramel-cream apple dip recipe. I just made 2 batches of this. One with coconut oil and the other with a vegan butter (I’m dairy intolerant) and both with coconut sugar since I don’t do refined sugars. Both came out great! The one with the oil is more mild with a hint of coconut, while the other is a stronger flavor. This was a great recipe! Thank you for sharing your experience, Rachael, and I’m glad the recipe worked well for you.